Aquacal Water Source heat pumps transfers free heat from drilled wells, lakes, cooling towers, or even the ocean to your swimming pool. It’s safe, efficient, and gentle on the environment. A Geothermal heat pump transfers heat from a water-source to your swimming pool water. A water-source swimming pool heat pump, also referred to as a geothermal heat pump, transfers heat from a water-source to your swimming pool water. 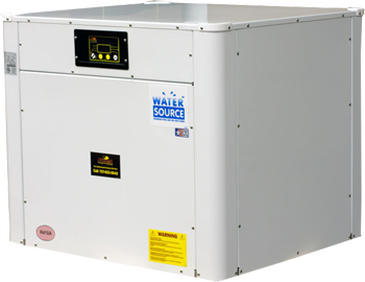 Source water enters the unit and passes over an evaporator coil, which contains a cold liquid refrigerant, often referred to as “Freon.” As the source water passes over the coil, the refrigerant heats to become warm Freon gas. The source water cools, exits the evaporator, and travels back to the water-source. The warm Freon gas passes through a compressor, which compresses it to hot Freon gas. Then, this hot Freon gas passes through a condenser, which is where the pool water enters and exits the unit. The pool water washes over the coil, heats, and leaves the unit warm. As heat transfers from the coil to the pool water, the hot Freon gas cools to once again become cold refrigerant, and the process starts again. 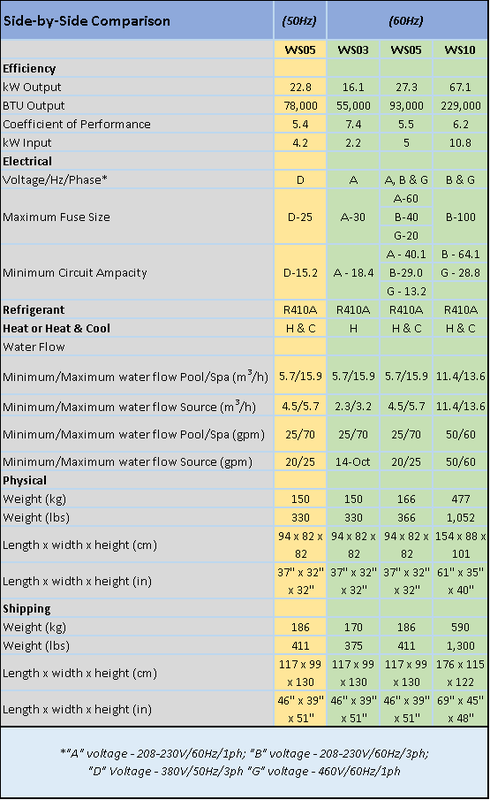 Because many types of bodies of water exist, many types of water-source heat pumps exist. Some common water-source systems are explained below. Also known as a deep ground well, an open loop consists of two deep wells: one that supplies water to the heat pump and one that returns water back to the ground. How can you tell if your well is deep enough? The bottoms of deeps wells should be within porous rock-based soil. By contrast, the bottoms of shallow wells are typically within sandy soil. A shallow well is subject to rapid draw down and clogging from loose soil. Also known as a ground loop, a closed loop system uses the ground as the heat source, rather than the water itself. In this system, plastic tubing is placed underground. A mixture of water and glycol (an antifreeze) circulates through the tubing and collects heat from the ground. The heated mixture returns to the heat pump to heat the evaporator coil. A closed loop system can be either shallow and wide (called a horizontal closed group) or deepand narrow (called a vertical closed group). A surface water system is a type of open loop system. This system draws water from an open body of water. Keep in mind, however, that higher maintenance is required to keep the water-to-refrigerant heat exchangers free of fouling from organic materials. Either fresh water-sources or salt-based water-sources can be used. We do not recommend salt-based water-sources because barnacles and sea mussels can clog the plumbing system and cause a need for equipment replacement. This water source is part of a large system that uses water to remove heat from a commercial air conditioning system. As the air conditioning system removes “waste” heat from indoors, it transfers it into a water loop. This loop is then cooled using a rooftop cooling tower. A water-source heat pump helps the air conditioning system operate more efficiently by tapping into this loop and removing this “waste” heat from the air conditioning system. Water-source heat pumps can also be used to transfer heat from unheated swimming pools to spas. Because of the large size of a swimming pool, you can transfer enough heat from a swimming pool to warm a spa without noticeable decreasing the swimming pool’s temperature. Specifically, you can use a 50°F (10°C) swimming pool to warm a spa to 104°F (40°C). We Make Acquiring your Geothermal System … Simple! We know one-size doesn't fit all, but we are committed to helping our clients save money and help the environment. Which option is right for you? Don't forget to ask about our 5 year "Bumper to Bumper Warranty!" Ready to Save Money AND Help the Environment?